The rap on Wes Anderson is that his movies are fun to look at but lack substance. In designing vivid, self-contained worlds, he fetishizes material things—clothes, contraptions and structures—while paying scant attention to plot, character development and ideas. Although Anderson’s meticulous craftsmanship and eccentric stylings can feel precious and twee, ugly things do happen. His movies are not escapist in the sense that characters dodge suffering and strife—not even in “Fantastic Mr. Fox,” based on Roald Dahl’s children’s book. (The teen runaways of “Moonrise Kingdom” and the characters inside the submarine at the end of “The Life Aquatic With Steve Zissou” come closest to finding irony-free tranquility.) In other words, aesthetic pleasure is not a panacea for Anderson, yet it is plausible to infer that he values form, artistic creativity and the appreciation of beauty above all else. Less fussy and insular, his latest movie tests this proposition as it contemplates the power and limits of storytelling and the artistic impulse. 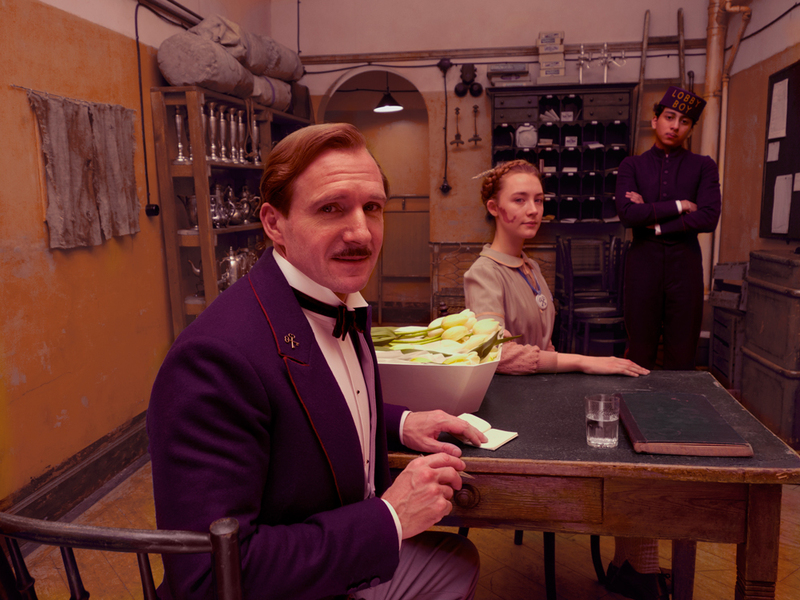 Inspired by the writings of Stefan Zweig (1881–1942), The Grand Budapest Hotel imagines what happens when an aesthete’s precisely constructed existence is upended by political and cultural turmoil in addition to interpersonal conflict. Set in the fictional Eastern European Republic of Zubrowka, the picture revolves around the epicurean Monsieur Gustave H (Ralph Fiennes), concierge at the titular alpine resort. Over a meal in the hotel’s dining room in 1968, the mysterious Zero Moustafa (F. Murray Abraham) recounts Gustave’s story to a writer (Jude Law). Flash back to 1932, when, on his first day as a lobby boy, the orphan and war refugee Zero (Tony Revolori) becomes Gustave’s protégé. A font of aphorisms concerning the hospitality trade (“Rudeness is merely an expression of fear”) and the art of fine living, Gustave caters to guests’ needs with a mix of steely efficiency and joie de vivre. He derives the most satisfaction from servicing very rich, very elderly matrons. Part gigolo, part majordomo, part liveried bon vivant, he is the embodiment of late belle époque splendor, erudition and decadence. When his favorite patroness, 84-year-old Madame D (an unrecognizable Tilda Swinton) dies, she bequeaths him a priceless painting. This sets in motion a continental caper. Her son (Adrien Brody) unleashes his henchman (Willem Dafoe) on anyone impeding his access to her fortune. There’s a jailbreak and a ski-and-sleigh chase; a lawyer loses four fingers; and one unfortunate soul loses her head, literally. Gustave tries to maintain his sense of decorum whilst doggedly pursuing a financial windfall from his wrinkly amour. At a crucial juncture, he enlists the support of his brethren in the Society of Crossed Keys. And in the course of aiding his mentor, young Zero falls in love with Agatha (Saoirse Ronan), a baker’s apprentice. Eventually, war breaks out and a Nazi-esque army occupies the hotel. An era of privilege and excess gives way to barbarity and dislocation, followed by the deprivations of Communism. Anderson approaches the material through interlocking narrative frames and with his trademark visual élan. The art direction, costuming and camerawork are impressive, as is Alexandre Desplat’s authentic music. Anderson and company make deft use of color and the scenery in and around the German town of Görlitz, while also employing low-tech devices like scale models and painted backdrops to generate purposefully artificial effects. His enthusiasm for unusual conveyances is evident in a gondola sequence and cutaways to the hotel’s funicular. Surprisingly, the hotel does not become a “character” in the way one expects. The “enchanting old ruin” is always rendered with exactitude, but Anderson doesn’t fixate on the design or architectural minutiae of the physical space. He seems just as intent on rendering the idea of the Grand Budapest Hotel as he is on showcasing its material form. By not trying to determine its meaning and allure with excessive tinkering, he invites the viewer to do more interpretive work. This is underscored in the two scenes that bookend the movie and take place in a park in the present day. At the outset, a girl visits a statue honoring the writer who turned Zero’s story into a novel. In the final scene, she sits on a nearby bench reading the famous volume, naturally entitled The Grand Budapest Hotel. The edifice was demolished long ago, but the hotel lives on in a work of literature, gripping the imaginations of people who never passed through its doors. What the Grand Budapest represents—the content of the idea being apprehended—ultimately depends on the (fictional) book’s readers and the film’s viewers. Regarding what the hotel symbolized for Gustave, Zero remarks that he “sustained the illusion with marvelous grace.” From a purely aesthetic perspective, the “grace” with which Gustave maintained his ideal of the Grand Budapest, and hence his life’s work, is paramount. As it happens, Gustave has his harsh, crude side. No doubt his suave, confident lust for life is partly a mask, and Fiennes skillfully lets the melancholy and desperation show through. However, like Johnny Depp’s Willy Wonka, he can come off as more creepy than whimsical or profound. Ultimately, it is instructive to see Gustave as a hybrid figure—a cross between an impresario and the last of the Romantic artists. Deep down he knows his ability to orchestrate events outside the hotel, beyond the confines of his rarefied milieu, is limited. Snapping his fingers and issuing orders like an autocrat with exquisite taste is futile in the perilous, fractured landscape of Europe in the 1930s—unless he has a gun or tank to back up his aesthetic fiats. The time of the artistic concierge is ending. Soon he will be supplanted by the ruthless Nazi soldier, who will make way for the officious apparatchik. Of course, artists risk being pilloried or squelched (or, worst of all, ignored) in any political system. The natural response is to carry on creating. In essence, that is what Gustave does. He continues to facilitate, charm, bully and persuade in order to enact his vision. Foolishly or bravely, he will not abide attempts to stop him from authoring his destiny, from creating beauty and meaning where he chooses. The consequences for Gustave are dire and echo Stefan Zweig’s reaction to the political and cultural upheaval in Europe. After decades diagnosing his angst-ridden age in reams of fiction and nonfiction—and befriending countless fellow artistic and intellectual luminaries of the early 20th century—Zweig was condemned by the Nazis. He fled his native Austria, where he had been born into a wealthy Jewish family, and made his way to Brazil, where, sadly, the consolations of making and championing art ceased to sustain him. He committed suicide in 1942. Another, healthier response to suffering is discernible in the character of Zero, whose own story is inextricably linked to the fate of Gustave and the Grand Budapest. Despite enduring horrendous personal loss, he soldiers on without cynicism or bitterness. He enjoys the finer things in life (having been taught by a master) and his storytelling gifts show he values the efficacy of art and the creative life. But he is not driven by contingent, corporeal pleasures or by the pursuit of beauty for its own sake. Zero is instead animated by his love for Agatha, and it imbues him with genuine grace. Watching Wes Anderson quietly and unsentimentally make Zero the hero of “The Grand Budapest Hotel” should win over some of the director’s detractors. After all, who can take exception to the idea that love is the highest common denominator between living a fruitful life and creating great art? The critic failed to mention that the movie is a comedy. This article also appeared in print, under the headline "The Art of Hospitality," in the April 7, 2014 issue. John P. McCarthy writes about theater and film for The Journal News and Catholic News Service.